J. Russell Hughes Stokes The Hovind Family Feud – Kent Hovind v. Robert Baty – The Great Debates! J. Russell Hughes is the old, has-been lawyer who appears to have helped Kent Hovind’s Alyssa Carone get her 4 children taken away from her so she could take up with her boyfriend, the preacher’s kid, get pregnant again before her divorce was final, and start over. Kent has now taken up with him and has been so impressed that he had Hughes appointed to his recently organized nominee 501(c)(3) organization. Today, July 5, 2016, Kent’s people posted an article which mostly contained a letter from Hughes detailing the Hovind feud over, as I understand it, a URL Internet address. We call it Hovind Hypocrisy for a reason and Hughes is a classic example of it. As a matter of law, I think Hughes realizes that Kent Hovind has no legal basis for claiming the URL should be given to Kent, and he indicates no inclination to negotiate for a sale of the URL to Kent or either of his known nominee corporations. Apart from that, it is my opinion that J. Russell Hughes and his sponsor Kent Hovind have no moral ground upon which to stand and propose that Eric Hovind has any obligation to simply turn the URL over to Kent Hovind. I don’t know what Eric might do, or how the matter might resolve. Kent Hovind has had a long criminal career and was called to account for just a few of his crimes. In the course of that criminal career Kent was effective in bringing his son Eric and other family members into his extensive criminal enterprise and compromise their integrity. Eric and his siblings might well have been successfully prosecuted were it not for the generosity of the prosecutor’s discretion. Jo Hovind, Kent’s wife, was not so successful in avoiding prosecution. Kent Hovind sent his wife to prison as assuredly as King David sent Uriah to his death. In addition, Kent Hovind managed to saddle Jo with millions in personal income tax liabilities. And what about Andrew Hovind, Mr. Hughes? The rumor is that Kent Hovind is personally responsible for Andrew’s life-long disabilities as a result of neglect; denying Andrew necessary and appropriate medical care when he was a small child. Eric has, apparently, pledged his life to caring for his broth Andrew and has, to date, been successful in providing him with gainful employment. It is unlikely that Andrew would be as gainfully employed and able to contribute to the support of a wife and two small children were it not for this brother Eric who stepped up. 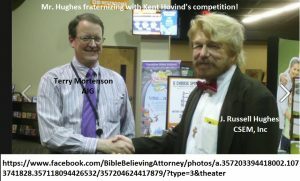 Shame on Kent Hovind and his surrogate J. Russell Hughes. No, Mr. Hughes, and you should know that Kent’s criminal forfeiture as ordered by the Court had nothing to do with what the IRS might have admitted to regarding questions about its civil enforcement procedure and certain cases affected thereby. Shame on J. Russell Hughes and Kent Hovind. Come out, J. Russell Hughes. Excellent Article, Robert. I’ve lost any respect I might have ever had for Hovind (which wasn’t much), when he started treating his own family like he does. I wonder what his siblings think about him? I have edited the article above a bit to try and make it easier to read.